Volvo’s long line of off-roading wagons continues in its fourth iteration, the new Volvo V90 Cross Country. Essentially a raised version of the V90, it adds a modicum of go-anywhere capability to latter’s traditional qualities of safety and practicality. As usual, the Cross Country is visually differentiated from the standard models through the use of black plastic body cladding around the bumpers, side sills and wheel arches, along with silver skid plates front and rear. The Cross Country script is embossed on the rear bumper. 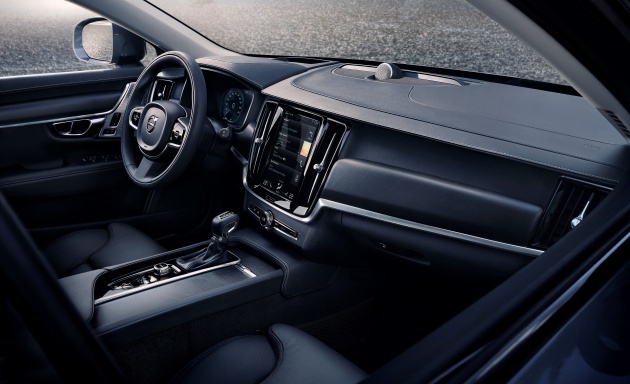 The interior has been left unchanged, retaining the standard V90’s minimalist Scandinavian-inspired design, portrait-format touchscreen and 560 litre boot (expandable to 1,526 litres with the rear seats folded down). To fit the remit of increased off-road performance, the Cross Country’s ground clearance has been raised by 65 mm to 210 mm, with the increased approach and departure angles protecting the front and rear ends on steep slopes and uneven terrain. There’s also a new Rough Road drive mode to complement the existing Eco, Comfort, Dynamic and Individual settings, while Hill Descent Control will be offered as well. 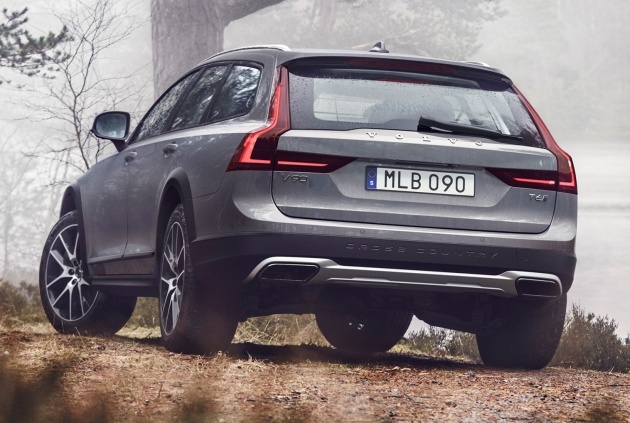 As with the V90, the Cross Country gets double wishbone front suspension and an integral rear link with a composite leaf spring, with rear air suspension and Four-C adaptive damping available as options. A BorgWarner four-wheel drive system is standard, defaulting to a front-wheel drive setup in normal driving, but can instantly send up to 50% of torque to the rear wheels when needed. From launch, the V90 will be available with the usual Drive-E 2.0 litre turbocharged four-cylinder engines. Petrols include the T5 that produces 254 hp at 5,500 rpm and 350 Nm of torque from 1,500 to 4,800 rpm; the T6 adds a supercharger on top to boost outputs to 320 hp at 5,700 rpm and 400 Nm between 2,200 and 5,400 rpm. No mention of a 407 hp/640 Nm T8 Twin Engine plug-in hybrid as yet. On the diesel side, the D4 puts out 190 hp at 4,250 rpm and 400 Nm from 1,750 to 2,500 rpm, while the D5 generates 235 hp and 480 Nm. The latter also benefits from the PowerPulse system which uses an air compressor and a pressurised tank to feed air into the turbo, improving engine response. An eight-speed automatic transmission is standard-fit, with the D4 also getting a six-speed manual option. My fren says his company only accepts toyota/P2 customers. Volvo/Honda/P1 r too safe, bad for their business. as a Wagon owner, the first gen V70( & V70-R) are still the best looking Volvo Wagon ever! 50+ photos of the car from all angles and not ONE single photo of the back seat? This is not a coupe it’s a family car!